This, about the soil in my garden. In my defense I explained to my critic that its condition was much worse when we started gardening this land four years ago and that we had done lots to build it up. And I pointed out that we have some pretty nice crops growing out of it right now. That must have sounded pretty lame to our guest, Koji Itonaga, a professor at Nihon University’s College of Bioresource Technology and cofounder of the Permaculture Center Japan. “Even so,” he said, “soil is supposed to be dark, moist and fluffy, rich in nutrients.” He knocked around some of our soil with his shoe, kicking up a bit of dust. Suddenly my garden seemed like a patch of lifeless dirt. OK, so I’m suddenly feeling like an amateur gardener with a poor excuse for soil in my garden. 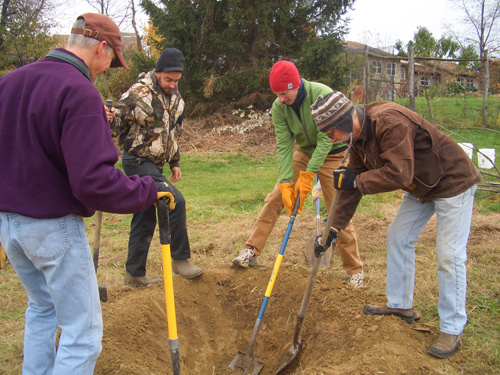 “What can I do to create the wonderful soil you’re talking about?” I asked. 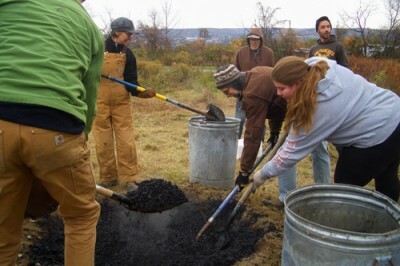 His response was, “Biochar.” He explained that basically, it’s charcoal that eventually gets added to soil. Not only is it a great soil amendment, it sequesters carbon, and it’s easy to make—you just burn wood or other biomass while depriving it of oxygen. Great. Wait, bio what? Sequester? Burn without oxygen? That was the summer of 2014, during a tour of EcoVillage at Ithaca that we offered to students from Nihon University. After the professor and his group left, I stood alone in my garden dreaming of creating picture-perfect soil with biochar. But I knew I needed help. The prof’s “easy” biochar production method involved using containers that might be easy to find in Japan but not readily available in the U.S. And while burning stuff can be fun, it can also be dangerous. So I needed to find someone skilled and knowledgeable in biochar production. 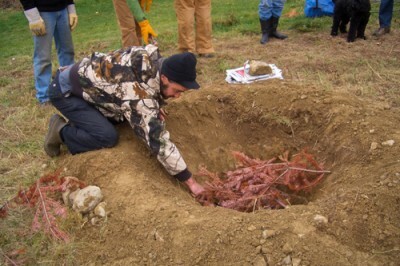 Enter Sean Dembrosky, owner of Edible Acres Nursery in nearby Trumansburg. 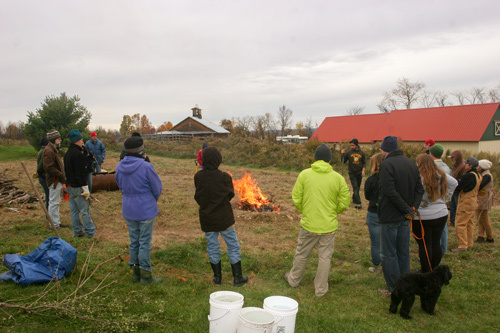 My wife and I met Sean at his nursery during the Finger Lakes Permaculture Tour that same year and found out that he had already been making biochar for years. Passionate, articulate and eager to share, Sean was our man. I asked him if he would help us make biochar and we started planning right away. During his planning visit, Sean looked over some of the woody debris our village had collected over the years, helped us identify a good charring site and offered ideas on how we might best use biochar and benefit from it. We decided that we had more than enough wood to burn that would otherwise take years to break down into soil. Turning it into biochar would help us get rid of some of our slash piles, enhance the quality of our compost and sequester carbon–a win, win, win scenario. 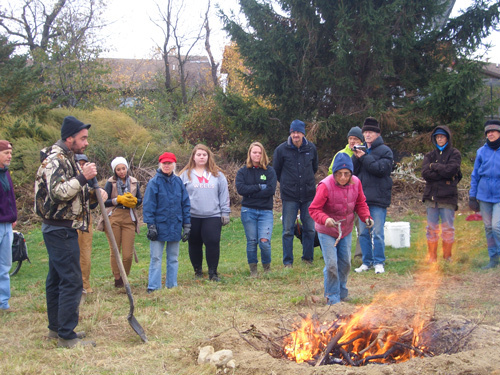 On October 14, 2015, Sean led an educational, hands-on biochar event in FROG, the first neighborhood at EcoVillage. 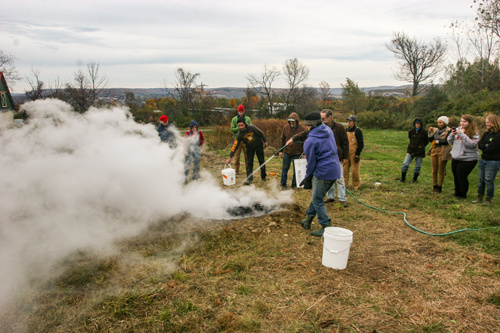 We ran two separate burnings open to the public; about forty enthusiastic attendees participated, including EcoVillage residents and friends, students from Wells College and folk from the Tompkins County Master Composter network. Sean instructed us on safety, talked about some of the history of biochar (the “terra preta,” or black earth, in the Amazon), led us through the entire charring process and taught us how to get the most from our finished product. Once the hole became full with burnt matter, we thoroughly doused it with water until it was completely extinguished. This kept ash from forming, locking the carbon into the finished charcoal. At the completion of our second char we ended up with nearly 200 gallons of charcoal. After talking it over with Sean, we planned to use it by layering the charcoal into our community compost to charge charcoal and to enhance the texture and nutritional composition of the finished compost. 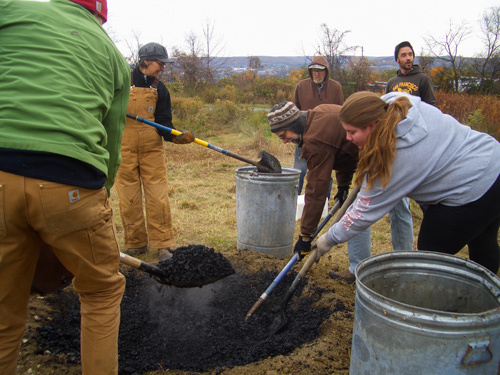 One of the environmental benefits of this activity is that the carbon captured in the biochar is returned to the soil and stays there for years to come—this can be thousands, or even hundreds of thousands of years. Sequestering carbon is one possible way to fight global warming by slowing the release of a greenhouse gas. Sean shared with us how he continues to improve his biochar activities—from having his charcoal tested at a Cornell University lab to experimenting with ways to capture the energy produced during charring (read: outdoor hot tub!). The excitement generated by this exhilarating and educational event has spilled over into our village at large. Each of the three neighborhoods are now motivated to pull resources to make biochar a new part of our experiment in sustainable living. 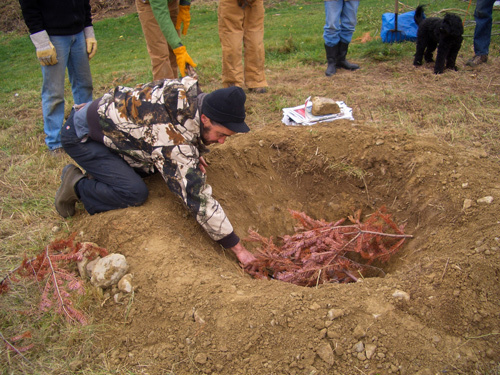 Thank you Sean for sharing your time and expertise, thank you professor Itonaga for the idea, and thank you to all the planners and participants in helping make our biochar event a successful step toward a more liveable future. 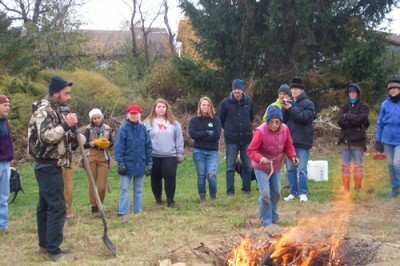 The writer, Kurt Pipa, is a member of the FROG neighborhood Berm Garden at EcoVillage Ithaca, which sponsored this biochar event along with EVI Inc., the non-profit at EcoVillage, whose mission is to steward the land at EcoVillage. 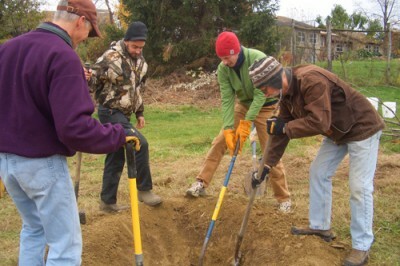 Kurt lives with his wife in FROG, oversees his neighborhood’s composting system and is a Master Composter of Tompkins County.